We now have 56 collaborative quilts completed or in progress. 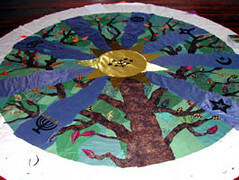 Thirty-five quilt-makers are working with faith communities and interfaith youth and adults on quilts that represent such diverse traditions as: African-American and Southest Asian Muslims, Baha’is, Native Americans, Mormons, Wiccans, Buddhists, Evangelical Christians, Seventh Day Adventists, Secular Humanists, Jews, and many more. 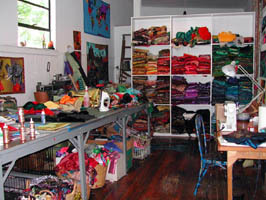 All the quilts will be shown at the Grand Exhibition at the Boston Center for the Arts’ Cyclorama between April 6 and 10, 2006. 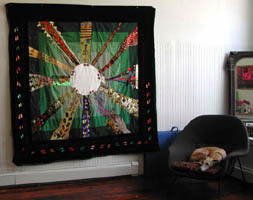 From there, the quilts will be divided into smaller groups and exhibited throughout April at the Boston Public Library, the Great Hall in Codman Square (Dorchester), the Museum of the National Center for Afro-American Artists, Cloud Place (youth quilts) and at a site at Harvard yet to be determined. While the quilts hang in a great circle at the Cyclorama, there will be opportunities for conversations with the various Faith Quilters and groups as well as a number of performance events, and installations which look at faith and the human spirit through a variety of art forms. This will include such things as: the quilts, of course, plus a night of sacred dance from many lands and many cultures; poetry workshops for youth and adults; a Tibetan sand mandala; the Boston Children’s Chorus; music from Zumix; an evening of sacred flute music and a drumming circle, plus the vital dialogue that undergirds our vision of this project. On December 31st, at First Night, we will hold the first of a series of workshops to invite adults and children to create small, brightly-colored flags inspired by the ancient traditions of Nepal and Tibet where people fly strings of prayer flags from roof tops, remote ridges, and high mountain outcropings where the prayers can be picked up by the wind and carried all over the world. It is our dream that, during the grey and windy days of March 2006, we will see strings of prayer flags from local citizens flying all over the city in anticipation of the grand exhibition at the Cyclorama in April. We are working with the Public Conversations Project on a number of opportunities for small exhibitions and dialogue events leading up to next April. There was a small exhibition of six Faith Quilts at the Peabody Essex Museum as part of the Museum’s observance of September 11th. In December there will be an exhibition at the Boston Graduate School of Psychoanalysis which will include a dialogue between Faith Quilt participants and members of the Graduate School. These are just some of our plans to date as we work to involve Boston in a citywide exploration of faith and the human spirit at a time when the world is increasingly engaged in political wars for them. The Faith Quilt Project will also be documented by a filmmaker who will compile clips of the process into a 20-minute documentary, to be used as a stimulus for dialogue and to bring other members of the community into the conversation. The film will be shown with the final exhibit and will serve as an educational tool about religious and cultural diversity in Boston. The Faith Quilts Project is the brainchild of Clara Wainwright, a quilt maker and public celebration artist who has directed over 40 collaborative quilt making projects in the past 14 years. After viewing a PBS Frontline program in Sept. 2002 entitled, “Faith and Doubt at Ground Zero,” Wainwright said she was inspired to harness the power of faith to work for good through a collaborative interfaith quilt project. “The idea was to bring faith groups together to create works of art which explained their faith to the wider world, with the hope of building dialogue and understanding,” she said. Maggie Herzig, dialogue consultant to the project, said the goal is to “integrate dialogue into every aspect” of the project. Participants will be asked to reflect on their deepest beliefs, be curious and share with others, and “lean into differences,” Herzig said. The quilts created are not intended to be theology lessons, Herzig said. 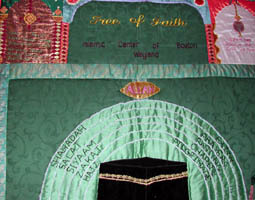 Instead, the quilts may express individual faith journeys and could be seen as “common ground quilts,” in that they may provide a forum for discovering similarities as well as differences among faith communities. The goal of the Faith Quilts Project is to create a lasting effect on interfaith relations in the Boston area. Herzig said the project hopes to leave a “legacy of dialogue” throughout the city. Since the anticipated 50 or more quilts will remain permanently with the communities who create them, they will occupy approximately 50 locations throughout the city as visual testimonies to the principles of dialogue. Through the dialogue fostered by the Faith Quilts Project, the group hopes to challenge stereotypes and educate the public about the diversity of faith traditions in Boston, Herzig said. The project seeks to build bridges between faith groups and promote an understanding not just of the religious beliefs and practices of the groups, but also of the role of faith in people’s lives. Through this understanding, the group hopes to encourage greater compassion and respect among different faith traditions. The group also hopes to strengthen communication on points of difference within each community of faith that participates in the project. 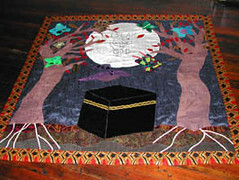 “Clara Wainwright (lead artist) is a quilt maker and public celebration artist. She has worked with youth and adults over the past 14 years on more than 40 collaborative quilts. She is one of the founders of First Night, a New Year’s Eve celebration of the arts and community. Boston’s First Night has served as a model for celebrations in over 200 cities around the world. “Maggie Herzig (dialogue consultant) is a founding associate of the Public Conversations Project, a non-profit organization in Watertown that designs and facilitates constructive conversations on difficult issues.